Description: Ghee is clarified butter of Indian origin and it is a very healthy and very efficient ingredient for cooking, with a higher burning point than simple butter. Prices range from 8-10 euro/250g for Ghee. it improves memory, rejuvenates the skin, antioxidant, used for psychiatric disorders, voice, heart diseases. 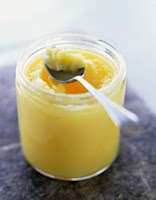 It is interesting to note that ghee, although it is made from plain butter, it tastes different. For a more effective sale and promotion it is shown in great looking containers. - Experimentation process until the final product achieves the best taste and commercial aspect. Disadvantages: - as a consumer product, small complications can occur with the authorization for the production process. Conclusions: This product has many advantages, unfortunately the market price is quite high, and so a possible deal on this niche could be a great success, especially as customers could benefit from health improvements at lower prices. 0 Response to "Ghee (clarified butter)"